Welcome to the nation’s oldest city! 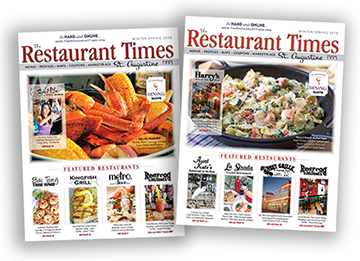 For more than 20 years, visitors and residents have depended on The Restaurant Times magazine to make informed dining decisions in and around the nation’s oldest city. With selections from every corner of the globe to the best local and regional fare, St. Augustine restaurants offer dazzling diversity for a city of its size. Now with our online blogs and features, we can jump off the page and go in depth about a subject everyone loves—food!